M!Table provides a help launcher which displays the M!Table help for the currently selected keyword. The IDE integration is done by the Team Developer's Tools interface. Open mtblhelp.app which is located in the folder corresponding to your Team Developer version and build an executable ( mtblhelp.exe ). For example, if you're using Team Developer 3.1, open mtblhelp.app from the folder <folder where you've extracted M!Table>\MTbl\TD31. Copy mtblhelp.exe to the location where where mtbl.chm and keyhh.exe reside. By default, you'll find these files in the folder <folder where you've extracted M!Table>\MTbl\Help. 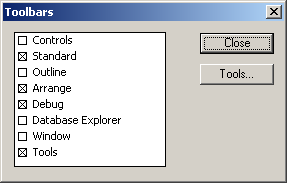 Open the tool editor ( menu item "User tools" or "Tools" ( depending on the TD version ) in the menu "Tools" ). 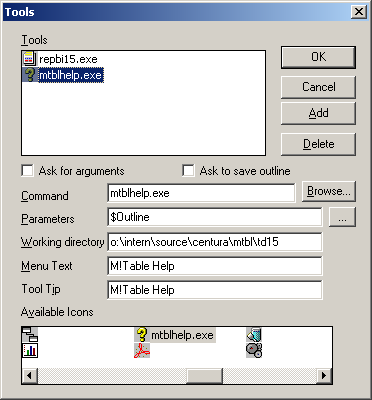 Type mtblhelp.exe into the field "Command". Type $Outline into the field "Parameters". If you're using TD 3.1 or higher, you have to type -MTX $Outline. Type the directory where mtbl.chm and keyhh.exe reside into the field "Working directory". Type something into the field "Menu Text", e.g. M!Table Help. Type something into the field "Tool Tip", e.g. M!Table Help. Choose an icon you like form the list "Available Icons". Step 3: Display the toolbar "Tools"
Select any M!Table related keyword in the outline. Press the M!Table help button in the toolbar "Tools" to show the help for the selected keyword.